Shabbychick Junk. : THE NEW JOURNAL NOTES ARE HERE! DID I JUST MENTION THE NEW JOURNAL NOTES BOOKLETS ARE HERE? 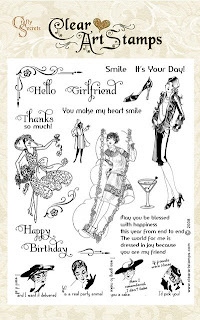 I got my package last night from Sandy at Crafty Secrets with all of the new images from the soon-to-be-released-at-CHA booklets with themes of Halloween, Christmas, Little Dolls & Girlfriends! I headed STRAIGHT to my stamp-hole & I made 3 cards last night! I'm heading in there to play again tonite (because you know how I love to pack...)! 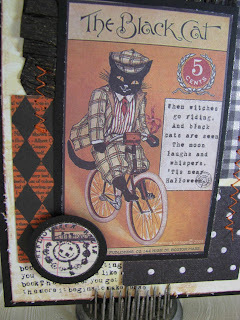 This Halloween cat image is SO COOL....it's so masculine, I would not have a problem sending this one to a guy! Check out the little round doo-dad in the lower corner...you will see this cool round image in an upcoming Halloween STAMP SET also! I used lots of my scrap paper in different sizes to make a quilty-background...I had to add the black plaid in there so that it would match his cool plaid outfit~! 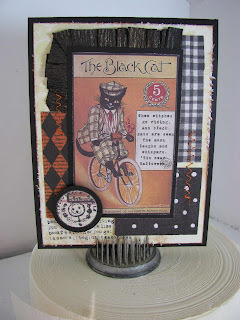 Sandy at Crafty just released photos of 2 of the new stamp sets on the Crafty blog...they are so cute and vintage! 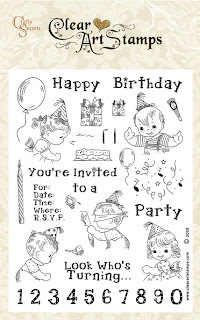 And this great birthday set is called "Birthday Kids"! Make sure to check the Crafty Blog this week for more samples and peeks...I'm also in the process of queueing up some blog posts with the cards I made with the new images so they will automatically publish while I'm at CHA from Thursday until Sunday...stay tuned for more images coming at you! After that I may procrastinate my packing some more! :) L.
Cute, cute, cute! I want the new journaling book and that Glamour Girls set! Have fun at CHA and behave yourself! Now that's a COOL CAT! I LOVE that plaid and your paper collage of prints. This would make GREAT guy card!